In-depth information by dedicated German Shepherd Dog breeders; Judging Seminars, Breeder Interviews, hip dysplasia candor, German Shepherd photos of top winners and working imports, four Breed Standards AND types to compare. Thinking about the German Shepherd Dog? Here's everything and everyone you need to know! 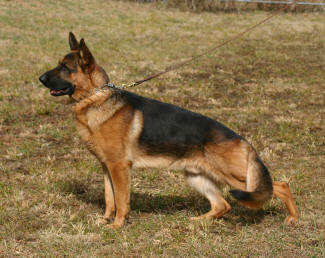 The four major GSD "types" are Pet, American, German Show, and Working. A pictorial essay including German and Eastern European Import lines. Ever think about a German Shepherd for security? 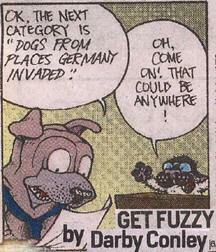 Perhaps a Schutzhund titled dog? Illustrated information by Gordon Garrett on the roached-wheelback toplines prevalent in the GSD showrings today. How to reduce incidence of hip dysplasia, preserve and guarantee good hips. Breeder-judge explains the differences in personalities, character, and conformation between the two types of the GSD, those that work and those that show. From roached backs, to hip x-rays, to Lloyd Brackett, this dog show judge shares breed history and information on the GSD. Instant information on the man often referred to as the father of the German Shepherd dog and Long Worth kennels. Jim Moses, GSD Breeder/Handler/Judge is to Herding Dogs what George Ward is to Terriers. Don't miss this exclusive interview! Frances Keyes of Nanhall Reg. Exclusive interview covers GSD imports, faults, specialty shows, and re-defines movement and character! Did you get a puppy for Christmas? Master trainer takes you inside puppy’s head, to understand litter-pack behavior and instill proper "watchdog" response. Will The True Working Dog Disappear? Pt. 1 - International judge, German Shepherd Dog Breeder, Schutzhund Trainer, Fred Lanting reveals the shrinking world of Schutzhund, Sieger Shows, and breed character. by International Judge Fred Lanting. Reflected by Rebecca Wong, a talented writer makes you feel "right there" with words and photos. Go to the biggest Breed Show In The World! expertly explained by Int'l Judge Fred Lanting. TheDogPlace is the Number One source for objective, balanced breed Information. Why? Because people like you care enough to help us educate a broad spectrum of new judges, aspiring breeders, and prospective owners. What can YOU do for the German Shepherd? Help the German Shepherd section grow! Opportunity's Knocking, what do you have to offer? German Shepherd Dog Clubs! No charge to publish Specialty Show photos and results! Links to your website from a top ranked site like TheDogPlace drive up your traffic and also boost your Google ratings. Learn more about search engine optimization for your website.